It’s exciting having a baby and every day is filled with learning how to best deal with obstacles and challenges that arise with the aim of making your family life as effective and as enjoyable as possible. However, having twins brings a whole new angle to the obstacles and challenges, and parents of twins will need to find beneficial solutions to these common problems. One of the biggest problems these parents face is monitoring their babies when they’re asleep. 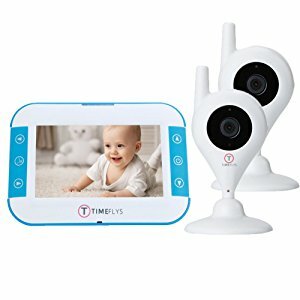 Usually, you would use a baby monitor but how can you monitor two babies with a single camera? The answer is that you don’t. With your children’s safety and well-being in mind, a baby monitor is one of the most effective ways to ensure your babies are safe while carrying out your day-to-day tasks. To help you find the best device for you, here is a complete list and review of my four favorites. How Long Does the Battery Life Last? Why Does My Device Need Night Vision? Why are the Viewing Devices Less Than 3-inches? To start my list, I’ve chosen an ideal, all-rounded, twin-specific baby monitor that gives you all the features you need for the best experience. With this device, you’ll be able to enjoy the benefits of two HD cameras which can be set up individually wherever you need them. Each camera can be viewed via a secure connection, using the included 4.3-inch LCD high-quality screen which will provide you with crystal-clear live video and sound of your baby at all times while also ensuring strangers won’t have the ability to pair with your devices. 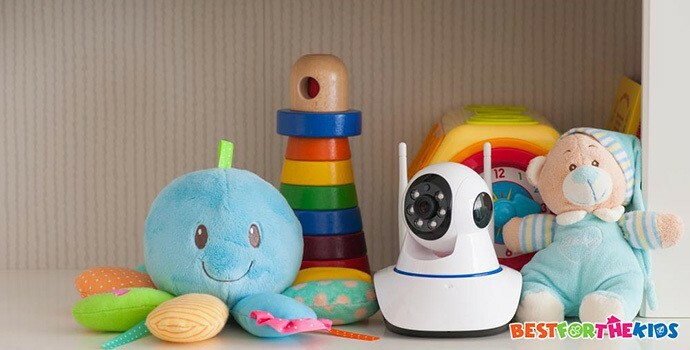 The cameras can pair with the device up to an incredible 800 feet away, allowing you to move freely around your house while guaranteeing your baby’s safety. What's Great About It: To ensure you can stay vigilant to your children’s needs throughout the night, the screen and cameras will automatically switch to an infrared night vision setting, meaning you’re continuously provided with a high-quality feed of your twins sleeping soundly. Next, I’ve chosen one of the earlier models from VTECH, simply because it’s still so feature-filled, even by today's standards. With this setup, you’ll be able to benefit from two individual cameras that can be set up any way you please which can be instantly paired with your viewing device. The viewing device is a crisp HD 2.8-inch LCD screen making it ideal for fitting into your pocket to take with you as you go around the house or for propping up next to you so you can keep a clear view of your children. The device itself is capable of supporting up to four cameras, enabling us, as parents, to keep a clear eye on our children to ensure their perfect well-being. This setup allows you to view live-video and has multiple viewing options for you to explore, including single screen and two camera feeds at the same time. There’s even an integrated automatic infrared night vision setting so you can see exactly what’s going on throughout the night. What's Great About It: In addition to all these outstanding features, you’ll be able to enjoy the added benefits of an included wall-mounting bracket so you can position the cameras up perfectly, as well as a low-battery alert on the viewing device, ensuring you’ll never have to worry about your children being out of sight. If you’re in need of a complete baby monitor experience where you won’t have to worry about certain functional aspects, such as battery power, Digital Color may have the set up for you. With this purchase, you’ll be able to enjoy the benefits of TimeFlys, a huge ion battery that just keeps on giving, ensuring you’ll never be without your baby monitor when you’re completing the tasks that need to be done throughout your day. With this setup, you can expect two cameras and an extremely easy to use viewing device, allowing you to watch your twins in full-HD, no matter what they’re up to. What’s more, in addition to the ability to add up two extra cameras, you’ll be able to control the cameras, directly from your device, allowing you to pan, tilt and zoom the camera from any room in your house. What's Great About It: What really makes this device shine is the 2-way communication feature. This means if your baby starts crying, you can talk into the device to start calming your babies down as you make your way to their room, ensuring your babies feel comforted if they’re feeling a little distressed. To conclude my list of favorites, I’ve chosen what can simply be described as one of the best twin-specific baby monitors on the market. Despite being slightly more expensive than the rest, you really do get your money’s worth with this awesome and helpful piece of kit. 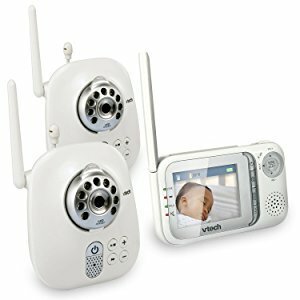 With this setup, you’ll find cameras that both have automatic infrared night vision modes as well as incredibly high-frequency microphones, ensuring you’re alerted the moment your twins show any signs of distress or simply want to see their mother. Included, you’ll find a 2.4-inch, crystal clear HD LCD display so you can see exactly what is going on in the room. The device also features a microphone so that you can comfort your baby through the screen to the cameras in their room. There’s also a built-in low-battery alert and an out-of-range alert. This means you can be sure that you’re always connected and always in the know when it comes to the well-being of your children. 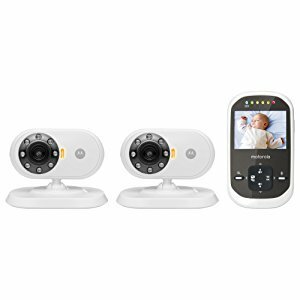 What's Great About It: Using state of the art technology, the Motorola Wireless Video Baby Monitor has built-in 2.4GHz wireless communications. This means no matter what you’re doing, you’ll be able to monitor with the uninterrupted video and sound feed from your children’s room, guaranteeing their safety. With so much choice on offer, it can easily become an overwhelming task when trying to decide which to pick. Scroll down to explore by complete buying guide, detailing everything you need to know and should remember when it comes to making that all-important decision. Baby monitors are not just for ensuring that your baby is asleep. Granted, if your baby sleeps in the same room as you, especially for the first few months, you may not need a baby monitor straight away, but if your twins sleep in a separate room to you, then it becomes an essential. These devices are also ideal for parents who may be deep sleepers. Personally, I am a very light sleeper, but it’s very reassuring to have the baby monitor so I can hear and see that everything is okay. My other half, on the other hand, is a very deep sleeper, so much so that he can sleep through our little ones crying at full force. A monitor is just what he needs to get up and complete his turn at ensuring that everything is okay. Furthermore, these monitors are great for later in life. When your twins grow into toddlers, it’s important that you monitor their sleeping patterns to ensure they are getting enough sleep. There’s no better way to do this than a monitor. It’s also the perfect accessory for monitoring independent playtime. As you are purchasing a monitor for twins, it’s essential that you have two cameras within your chosen package. This way, you can see the present condition of each child without having to worry about looking at your viewing device trying to figure out what’s going on. This solely depends on the brand of the product that you buy. As a rule of thumb, most viewing devices will last the entire day, but you won’t need all this charge in one go. When you’ve set up your monitor system, it’s good to get into a habit of when and where you’ll charge it. For example, if you monitor your children’s nap times while you’re preparing dinner, you can plug in your viewing device while it’s on. Likewise, if your children have gone to bed and you’re sitting watching TV, this is also a great time to keep monitoring your babies while on charge. Alternatively, you can simply charge the device while you sleep as it will get a full night charge while monitoring your twins. It’s safe to assume that while your children sleep, the lights will be off and it will be dark. Without night vision, you won’t be able to see anything in the room. With automatic night vision, such as the ones listed on my list of favorites, the device will automatically detect when it’s dark, switching to night vision on its own, meaning you’ll never have to worry about it. This is especially important when it comes to twins as you’ll be able to know exactly who’s crying and the reason. This is exactly what you need in the middle of the night as you can be prepared to deal with the problem, such as a pending change or burping session, allowing you to deal with it quickly and effectively. As you go about your day-to-day business, you simply won’t want a huge device that will just get in the way. Say you’ve put your twins to bed in the evening. As you’ve been with your children all day, it’s time to catch up with your work. You may be collecting and organizing washing, in which case you’ll need your hands-free to carry baskets. If you’re carrying a huge device around with you, it’s simply going to get in the way and cause you problems. Instead, a small, lightweight but high-quality device is perfect for ensuring that this doesn’t happen. Likewise, let’s say you are making dinner. You can simply prop your device on the counter while you do so, again, without it getting in the way. This makes your days so much easier and productive, allowing you to get more done with your time while ensuring the well-being and safety of your children. Always make sure you read the packaging or product description of your monitors to ensure that the cameras and the viewing device use a secure connection. Some devices may connect to your Wi-Fi network, so it’s essential you protect your network with a password. This stops anybody walking past to gain access to your video feed. With all the devices on my list, they all have built-in security to stop this from happening, but cheaper devices may not include this. It’s not worth trying to save $50 if you’re putting your child’s safety at risk. Hopefully the decision of which baby monitor is right for your twins has become a little easier. As parents of twins, you need all the help you can get to ensure that your days are easy and stress-free, enabling your little bundles of joy to be happy all the time which, in turn, allows you to spend more time focusing on your intimate moments as a family.